Anyone who wears a collared shirt understands the importance of looking professional which is why taking the time to iron shirts or bringing them to get dry cleaned is crucial. 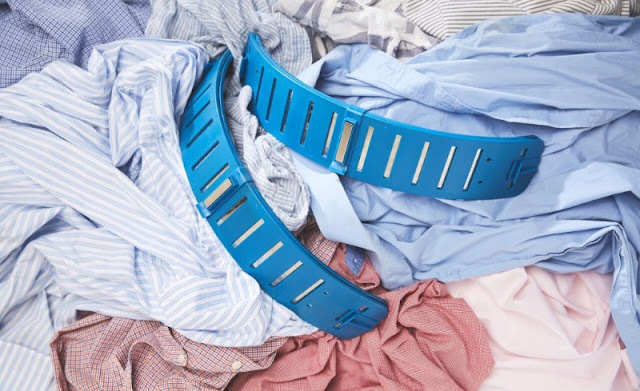 Now, anyone with a Collar Press can save money on their dry cleaning bills and cut ironing chores in half by allowing the dryer to do it for them. How it works: Simply snap on the product on the collar of your shirt and place it inside the dryer. The hot air generated by the dryer will heat up the stainless steel interior of the product, which will transfer on to the fabric of the collar, ironing it. It’s really that simple. “It can be used in two different ways. You can take a wrinkled shirt straight off the hanger out of the closet, snap on the collar press and put it in the dryer on high heat for a 10 minute ironing and refresher”, says Michael.